Now that I can drive again (being so happy about this), I sometimes park my car below the Schartenfluh to take pictures and get more acquainted with the middle part of the Gempen plateau. 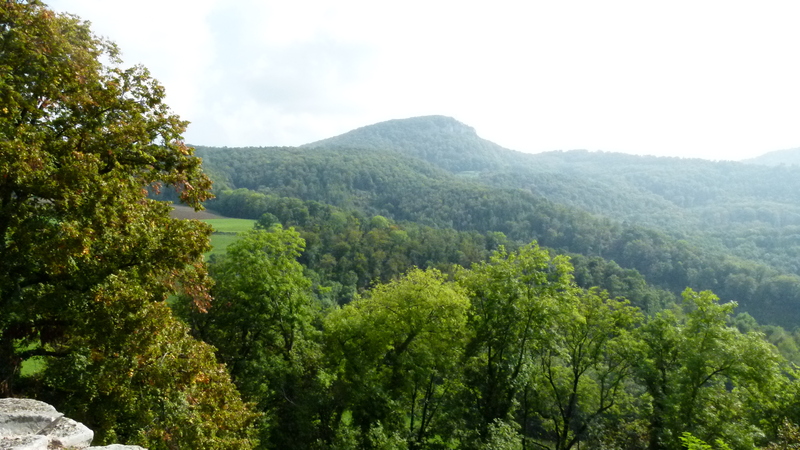 In this blog I am talking about the Schartenfluh (another “rock”), the border path (Grenzweg) between Arlesheim and Dornach behind the Goetheanum, the dome of Arlesheim and the vineyards “Schlossberg” and “Steinbruch”. 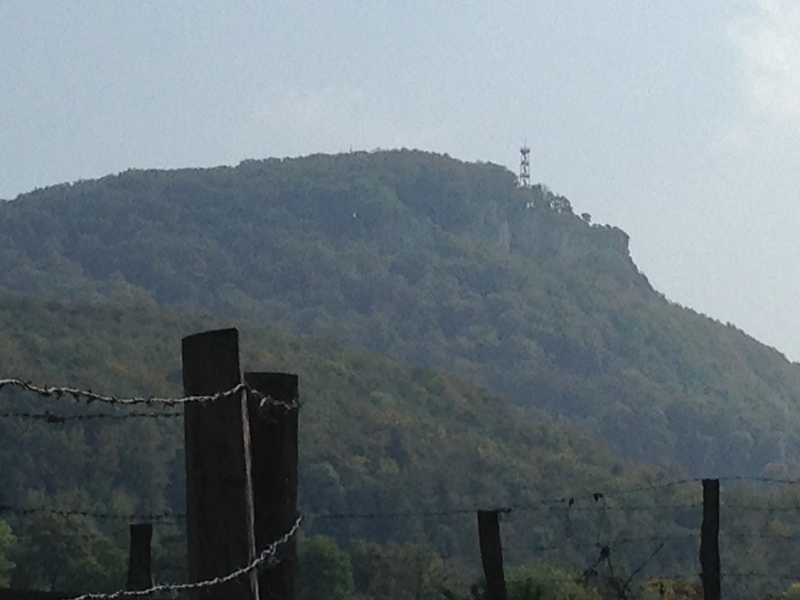 The Schartenfluh (sometimes called “Gempenstollen” or “Gempenfluh”) is the rocky landmark topping the Gempenplateau that can be seen from far – here is a picture taken from the fortification of Dorneck. The view from the Schartenfluh is superb and goes across the trinational area of Basel with the Jura, the Black Forest in Germany and the Vosges in France. When the weather is clear, you can even see the white Finsteraarhorn in the Bernese Alps. This selection shows the view of the Blauen, the Bruderholz and the suburbs of Aesch and Reinach stretching along the Birs. A tower invites to get an even better overview of the trinational area around Basel. 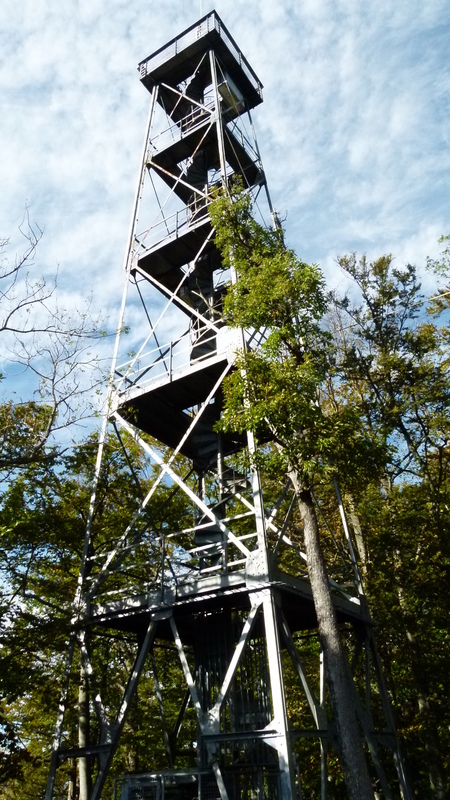 Climbing this tower requires to be free from giddiness. The roman-catholic church of Arlesheim is called “dome” indicating that it once has been much more important than a mere “church”: Correct. The dome and the related buildings have been built around 1700 to become the new noble residence for the cathedral chapter (Domkapitel) of the Prince-Bishopric of Basel (Fürstbistum Basel). The Fürstbistum Basel were the secular possessions of the bishop of Basel who resided in Pruntrut (he had to leave Basel during the reformation in the 1520’s). The cathedral chapter is the noble committee of the bishop. The Fürstbistum Basel was dissolved in 1792 (Napoleon) and the former dome became the roman-catholic church of Arlesheim (sources: Home Site of Dornach and for the Fürstbistum Basel: Wikipedia and “Historischer Atlas der Region Basel” edited by the Christoph Merian Stiftung, 2010). 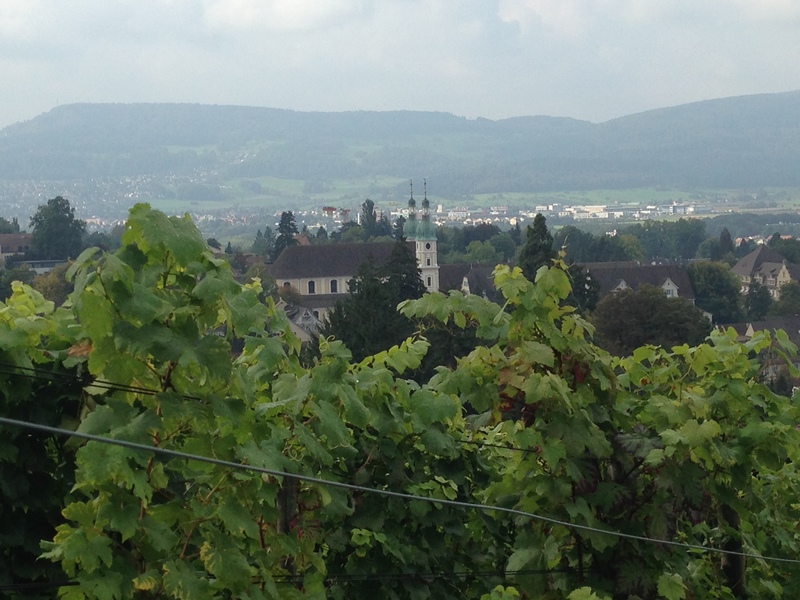 Here is the dome of Arlesheim taken from the vineyard “Schlossberg” of Arlesheim. There are two vineyards in Arlesheim: The Schlossberg (“castle slope”) and the Steinbruch (“quarry”) (see Weinbau im Birseck). 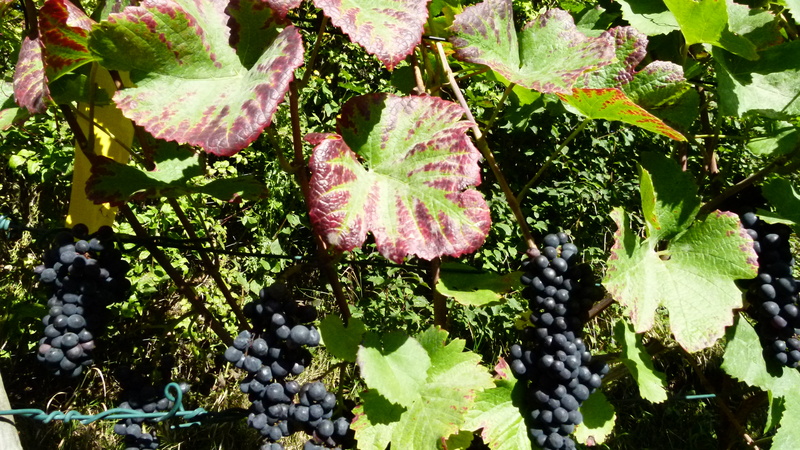 The mild climate of Arlesheim has always been favorable for growing wine. Both vineyards are steep and looking south to capture as much sun as possible. The noble committee of the bishop loved the wine of Arlesheim. Perhaps this is why they had their dome built here? Sometimes Frischluft organizes visits to the vineyards. They praise the wine of the traditional winegrower, Erich Rediger. Quergut has recently been founded by two new and innovative winegrowers, the couple Huber/Bühlmann and Thomas Löliger. 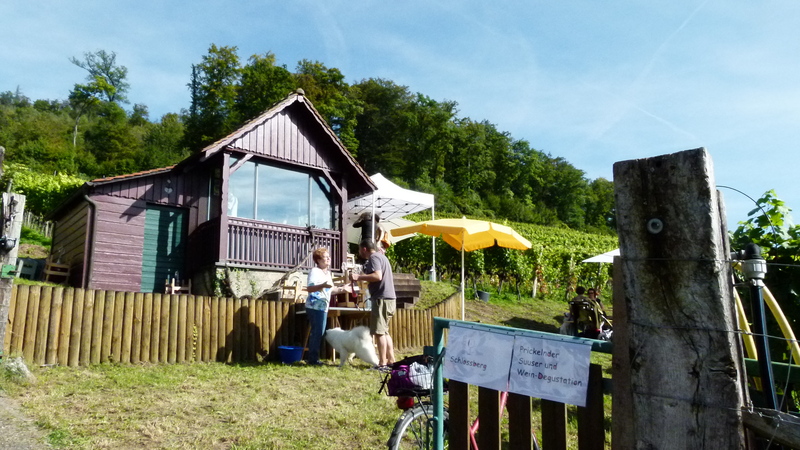 End of September they invited guests to their Schlossberg vineyard. I went and found myself amidst a group of teachers and artists – Michael Huber is a part time teacher at the Gymnasium Oberwil and a part time musician. His father has already grown wine here at the Schlossberg. Michael now follows in the steps of his father. In addition to Pinot Noir he has recently planted Shiraz and Cabernet Jura (the latter for blending, Michael tells me). The white grapes are Sauvignon Blanc (Michael says, the global warming makes it possible here) , Cabernet Blanc (a new breed of grapes) and Pinot Gris (in German: Ruländer or Grauburgunder). In the scorching sun I enjoy a sparkling Schlossberg Suuser (fresh wine) with a delicious pumpkin soup and later a fruity glass of Pinot Noir from the Schlossberg. These are vines in the Steinbruch or quarry. My friends from Austria stopped once in the restaurant Schlosshof close to the ruin Dorneck. 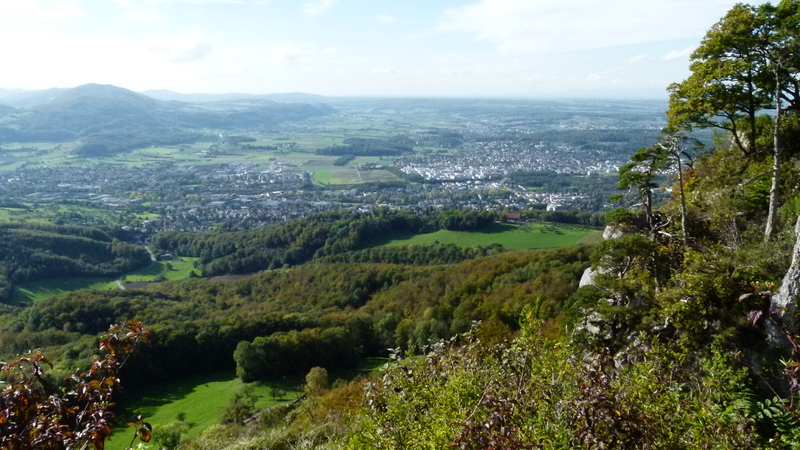 From here, a steep and romantic trail is following the border between the two suburbs Arlesheim (belongs to the canton of Rural Basel) and Dornach (part of the canton Solothurn). 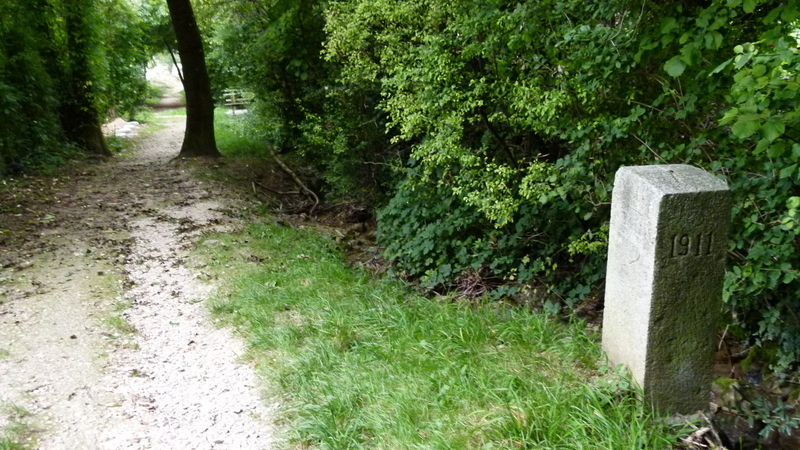 The border stones are the proof that there is a border here. The Grenzweg is a quiet path along a creek. Bridges lead to the gardens of noble houses. 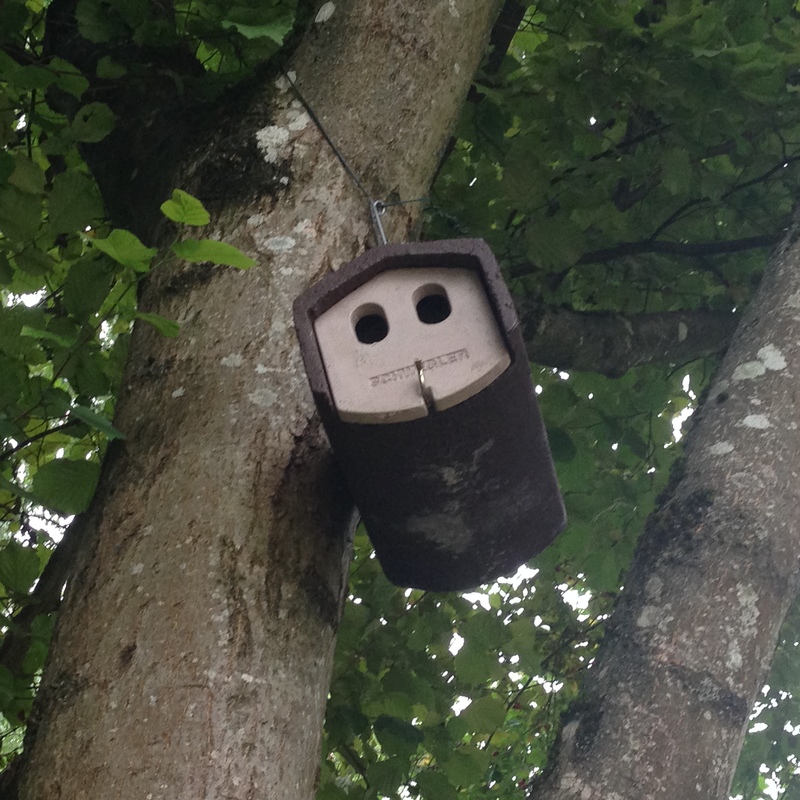 Also birds are invited to live and breed here. … and with its glass house (Glashaus). The name “Goetheanum” is derived from the German poet Goethe. Based on admiring Goethe for his Spiritual Science, Rudolf Steiner founded the Anthroposophical movement in the beginning of the 20th century. He made the Goetheanum their world center. 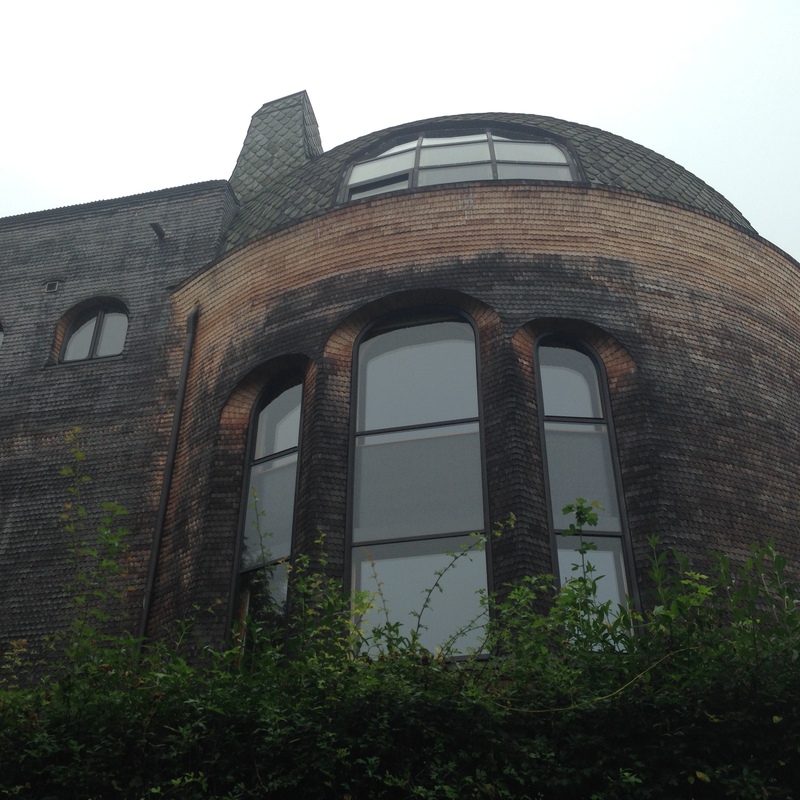 The first Goetheanum was built in 1908. It was a harmonious wooden building avoiding right angles – like most anthroposophical houses do here in Dornach. The first Goetheanum was destroyed by arson in 1922. My gran-ma lived in Basel then and told me that the fire could be seen from far. She was sad, because she found the wooden Goetheanum was beautiful. 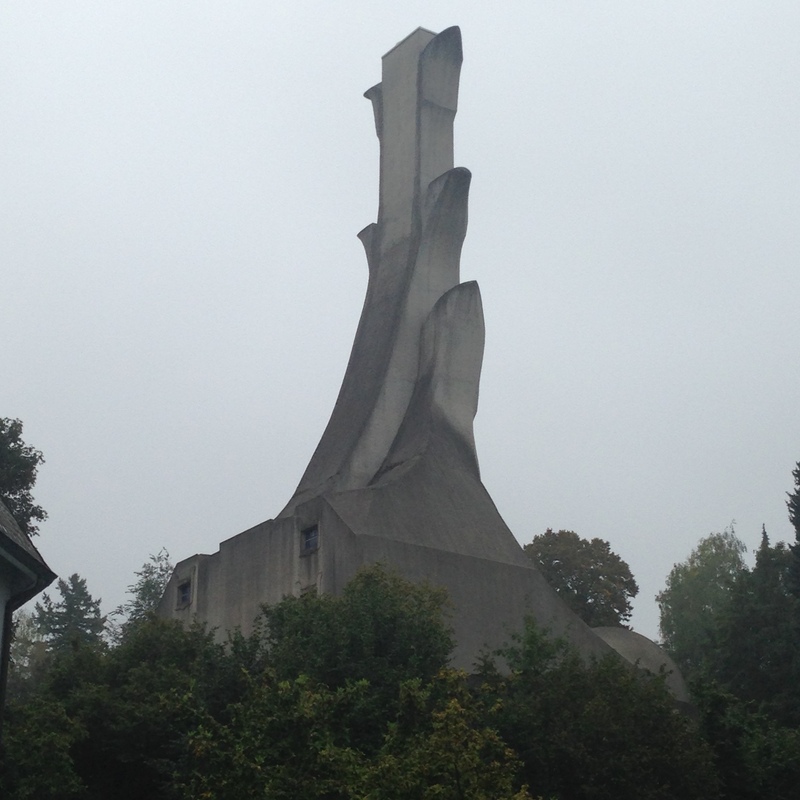 For the second version of the Goetheanum, Rudolf Steiner selected concrete. Again avoiding right angles the second Goetheanum was completed in 1928. The glass house (Glashaus) in the back garden was built to manufacture the stained glass windows for the first Goetheanum made out of wood. Also made out of wood, the glass house gives us an idea of what the wooden Goetheanum had looked like before the fire. The glass house has recently been renovated. It houses the school of Spiritual Sciences. … to my opinion it is just a pity that the reunification of the two half cantons of Basel has been denied in September 2014. Before the voting weekend end, there were many posters in Rural Basel (or “Baselbiet”) proposing “no – we remain independent”. 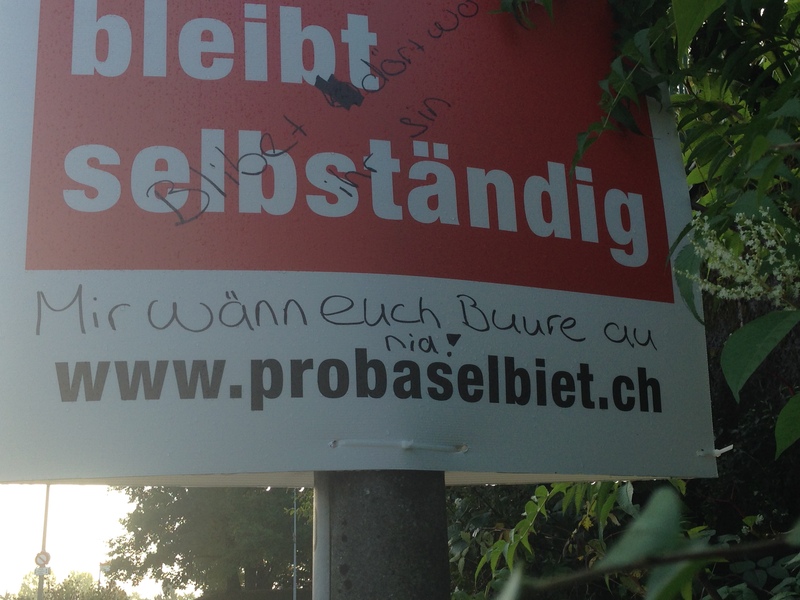 A frustrated citizen from Basel Town may have added the remark: “We also do not want you, farmers” (Mir wänn euch Buure au nid”). 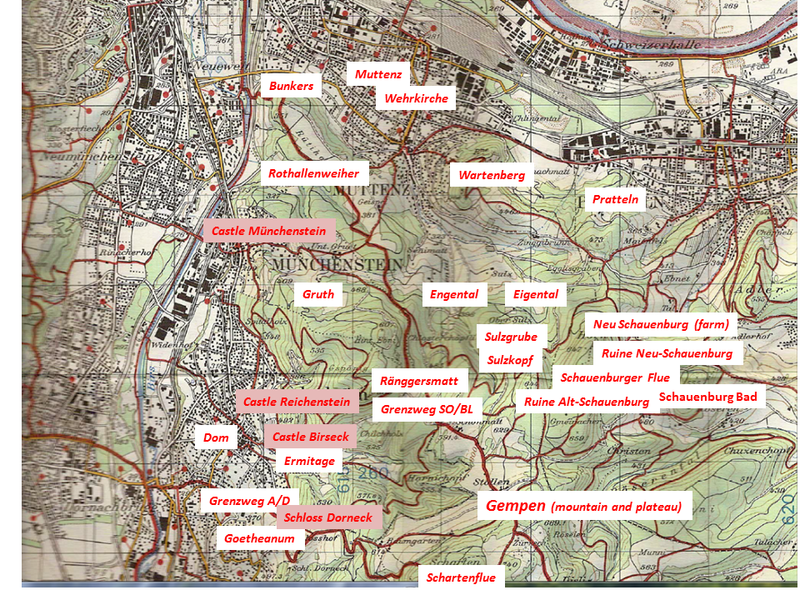 This makes me a little sad, as I have always loved both Basel Town and Rural Basel – and this year I was happy to benefit from the hiking options in front of my house door – in both half cantons. After having discovered so much around my home town Basel, I feel homesick for my mother town Berlin. 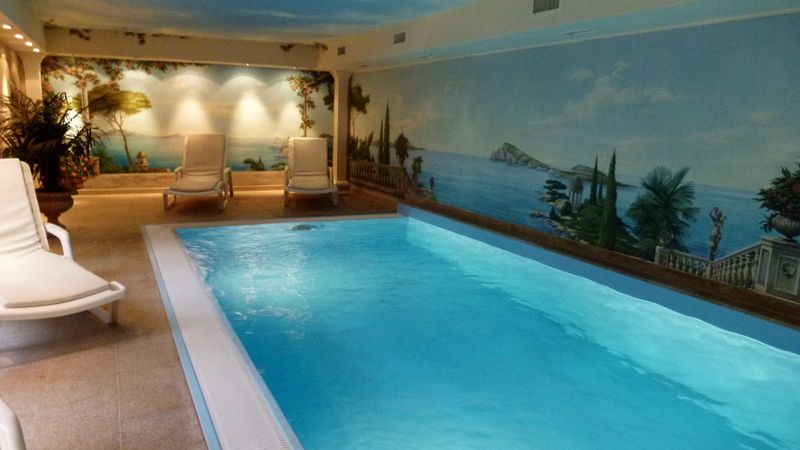 Sabine has booked two rooms in the Hotel Villa Kastania. I look forward to strolling through Berlin – first alone, then on the weekend – with her. 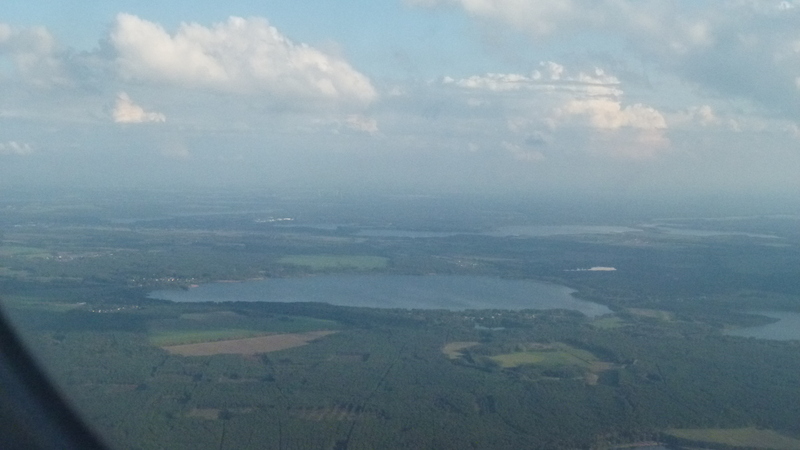 Easyjet loses height and the Müggelseen (lakes) appear in the window. We land softly at the sober ex-GDR airport of Schönenberg in the far south east of Berlin. It is about five pm. Immediately I notice that I am in a large town: Plates announce that the S-Bahn is not working due to strikes. Strikes – this is unknown in Switzerland. Shall I take a taxi? – Probably not a good idea. Instead I opt for the bus X7. Good decision. From the bus I can see traffic jams being announced. My bus quickly reaches the Rudow metro station. The metro is packed with people that try to get home using alternatives to the S-Bahn. At Bismarckstrasse I switch to the Ruhleben metro (I like this – Ruhleben means “quiet life”). I reach Theodor Heuss Platz about an hour after having landed. Just around the corner of Theodor Heuss Platz I find my Hotel Villa Kastania and settle in a quiet room. The restaurant looks welcoming. 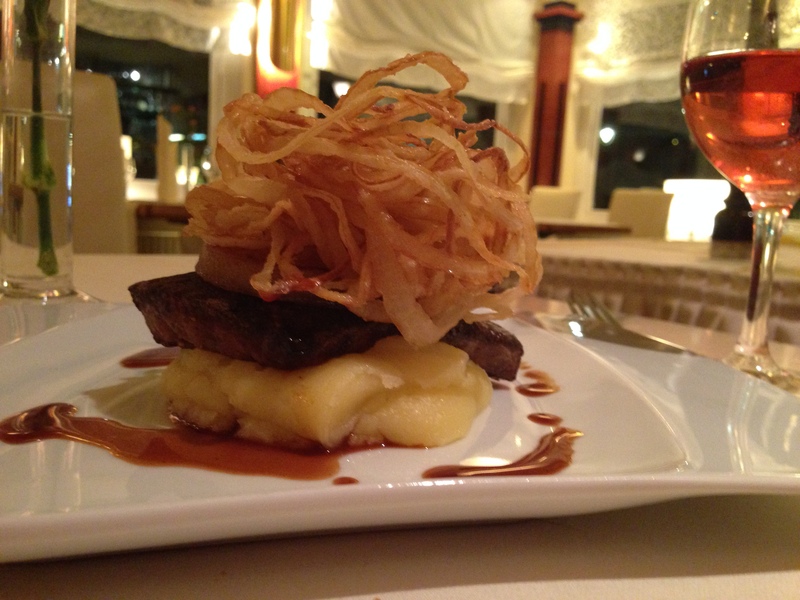 I take my dinner here: Liver cooked with apple and ognion – one of the dishes that my mum has brought me up with. Well, the hotel restaurant serves a “design version” of this common and delicious Berlin specialty. After having slept deeply in the quiet Kastanienallee, I take a swim in an Italian garden under a blue sky with a few cyrrhus clouds. Hungry I go to the breakfast room, and I am surprised by the morning buffet: It even includes fresh oranges and an orange squeezer. I have never had freshly pressed orange juice at a hotel breakfast buffet before. After the delicious breakfast I leave to see my favorite spots in Berlin again. This is the map of the Gempen plateau. Three castles I always saw from the Bruderholz, when I grew up: Dorneck, Birseck and Reichenstein – and they seemed full of fairy tales. 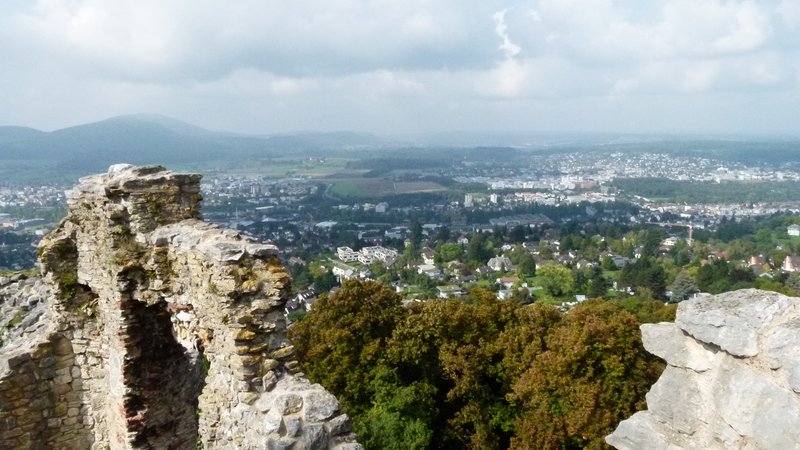 On the Gempen plateau, there are more castles such as Münchenstein, Schauenburg and Wartenberg. The region around Basel is full of castles. Why are there so many castles around Basel? 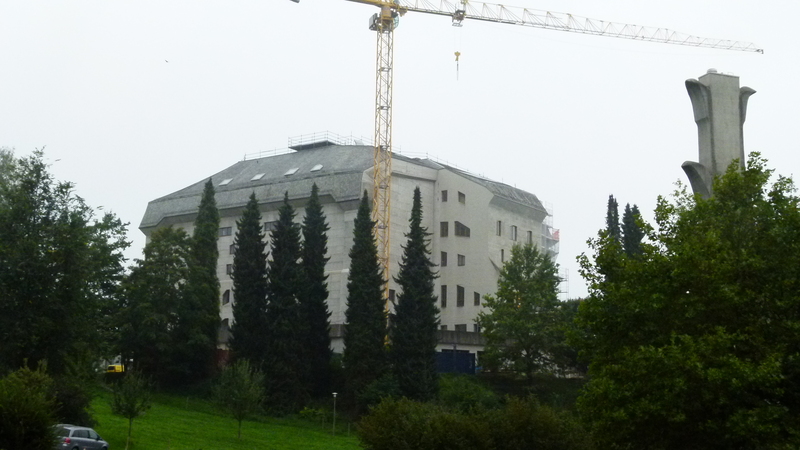 So many castles around Basel – I started to wonder why. So did our Burgenmeyer in 1981, when he edited Burgen der Schweiz – Band 7 (we call Werner Meyer just “Burgenmeyer” and we like his fresh style of teaching – I was fortunate to do my first steps in Latin with him). Also the “historischer Atlas der Region Basel” (edited by the Christoph Merian Stiftung in 2010) takes note of the large number of castles (p. 86). “Burgenmeyer” and the “Atlas” have been my primary sources, and sometimes I went back to wikipedia. Here is the summary of my conclusions. It may not satisfy scientific requirements, but may open our eyes, when walking in the area. About 400 A.D. the Roman empire breaks down. After the breakdown, the population is concentrated in the former Roman towns. The mountains with their valleys become empty woodlands. There is some prosperity in the Carolingian times (700-900), when Basel is part of High Burgundy (Hochburgund) and the center of the Basel Diocese. However, in the tenth century, Hungarians, Saracens (from Tunisia) and Vikings are invading the area and decimating the population again. In 962 Otto I creates the so-called Roman Empire of the German Nation that brings some stability. Noble families establish local lordships in the empty areas, cut the trees and build fortifications to protect their possessions. In the 11th to 13th century they continue with their colonization efforts. They now build stone castle, first in the valleys, then above the valleys on rocks. The families are changing – some are dying out, others are marrying and enlarging their possessions. Important names are Frohburg, Pfirt, Ramstein, Zähringer or Kyburg. In the 13th century it is the Habsburg family that gains most. The cultivation techniques improve which allows the population to grow, to move to cities and to become craftsmen and merchants. Also the nobility founds towns (e.g. the Zähringer are well-known founders of towns). The craftsmen and merchants are getting wealthier and wealthier. In the 14th century many towns become stronger and autonomous. They found town leagues and start to buy possessions from the nobility. In the great earthquake of 1356, 60 castles around Basel collapse, and not all are rebuilt. Many lords are already weakened. In the 15th century Basel buys Liestal, Waldenburg and Homberg, then Thierstein-Falkenstein, then Münchenstein and Muttenz and last they acquire Farnsburg and the valley of Diegten. In the 16th century Basel adds Pratteln and Ramstein to their possessions and agrees to leave Dornach and the village of Gempen with Solothurn. Basel installs bailiffs in the former possessions of the lords and some of them reside in the renovated castles. Politically the rural part of Basel split off in the revolution of 1833 to become the canton of Baselland. People in Rural Basel still complain about the bailiffs – and they absolutely refuse a political reunification with Basel town; they voted clearly “no” end of this September. 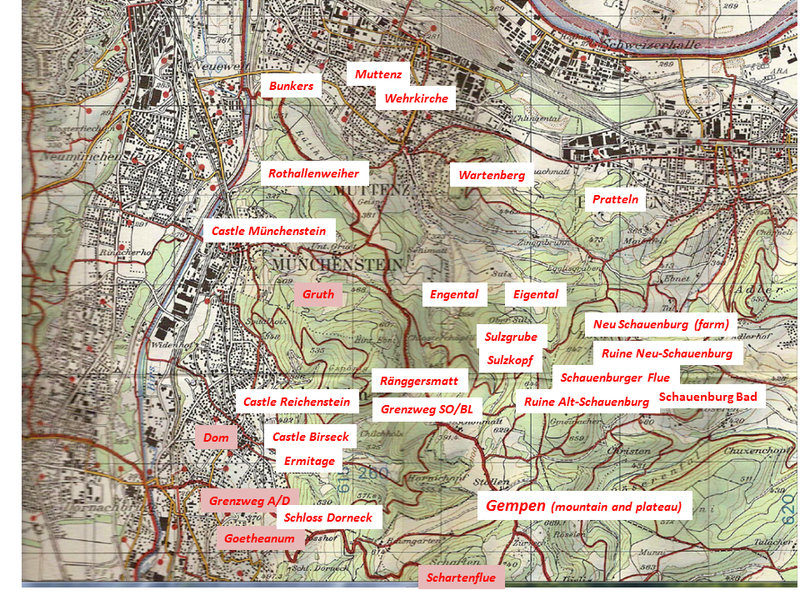 Now, let us have a look at the castles of Dorneck, Birseck, Reichenstein and Münchenstein. The construction of Dorneck above Dornach goes back to the 11th century. When acquiring Dornach in the 16th century, Solothurn delegated their bailiffs to Dorneck. The castle has been in use until 1792. The French destroyed it (source: wikipedia). This is entrance to Dorneck. Above the yard there is the platform with the Swiss flag and the three huge oak trees ..
… and from the platform, there is a superb view of the valley and the Jura. 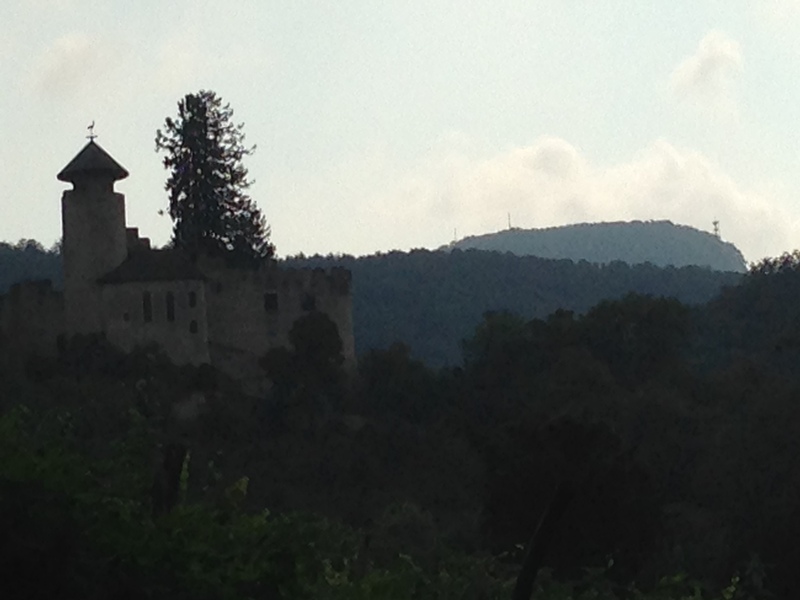 For almost 600 years, the Reichenstein castle belonged to the family Reich von Reichenstein (1245 to 1813). The castle was a feud handed over by the bishop of Basel. 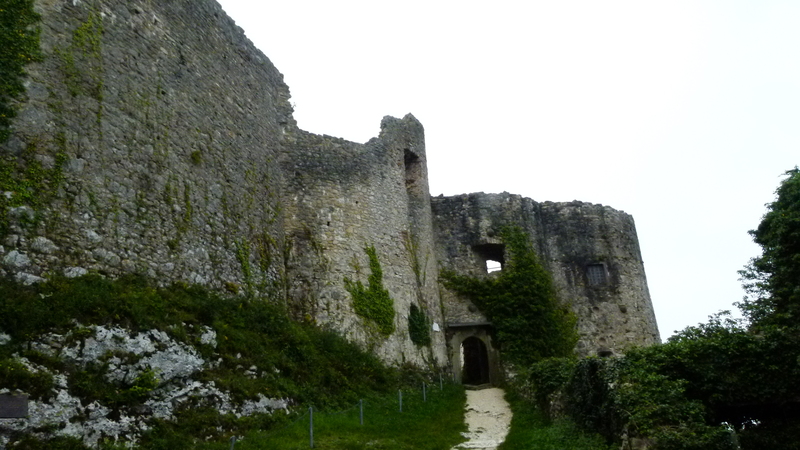 In the 15th century the Reich family neglected the castle and it decayed. 1813 it was acquired by wealthy Basel citizens. 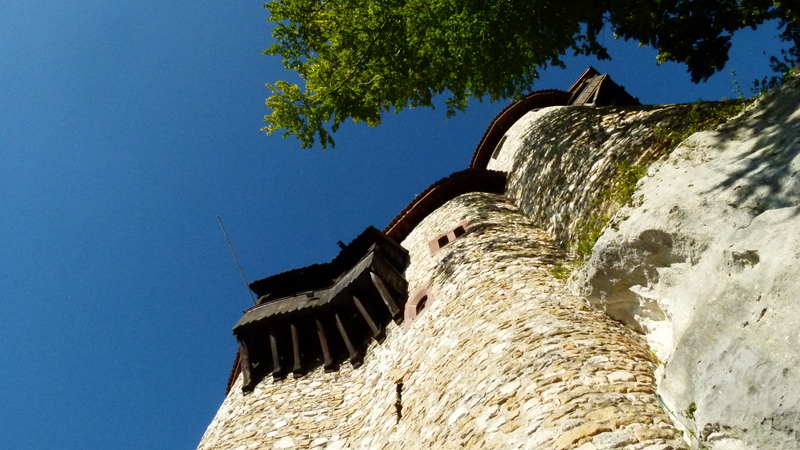 After 1930, the citizens rebuilt part of the castle based on romantic ideas and used it as a summer residence. Today the castle can be rented for events of up to 50 people (source: wikipedia). About 15 years ago I attended the birthday party of a good friend of mine in the great hall – this was a very noble setting for the party and the view from the tower is gorgeous. … and seen from the entrance below it is dizzily high. 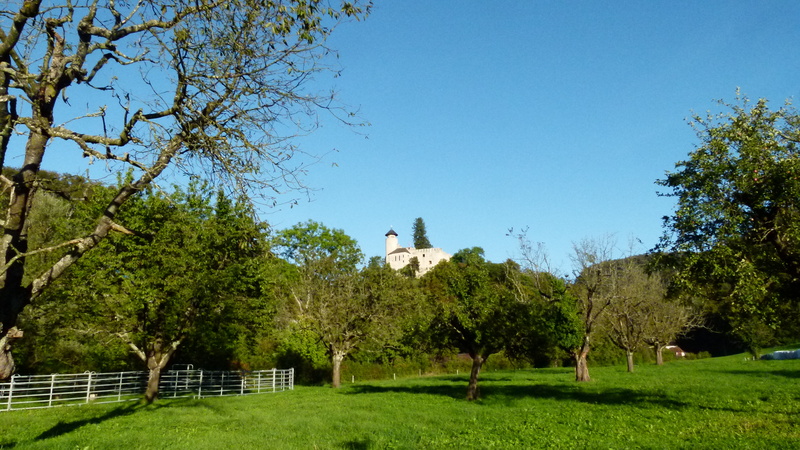 Just 500m away from Reichenstein is the fortification of Birseck with the integrated farm. The origins go back to the 12th century. Mid 13th century the bishop of Basel rebuilt the castle, used it as a residence and once even invited the pope. Until the 17th century the bailiff of the bishop lived here. In the 18th century the castle decayed and was renovated in a new gothic (and not authentic) style around 1800. A recent renovation took place in 2005 (source: wikipedia). The castle is integrated in the romantic English style garden “Ermitage” of Arlesheim. 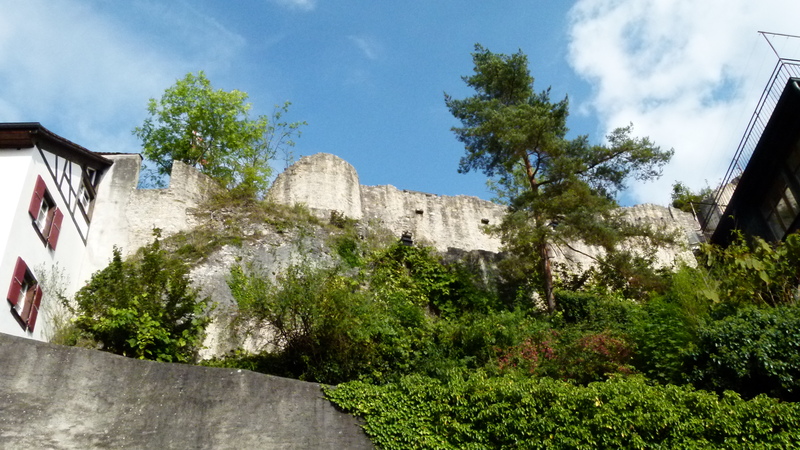 In the middle of the suburb of Münchenstein, there are the ruins of the castle of Münchenstein. The castle is a private property in Schlossgasse. Only between 7 am and 22 pm, access to the area behind the castle is allowed. 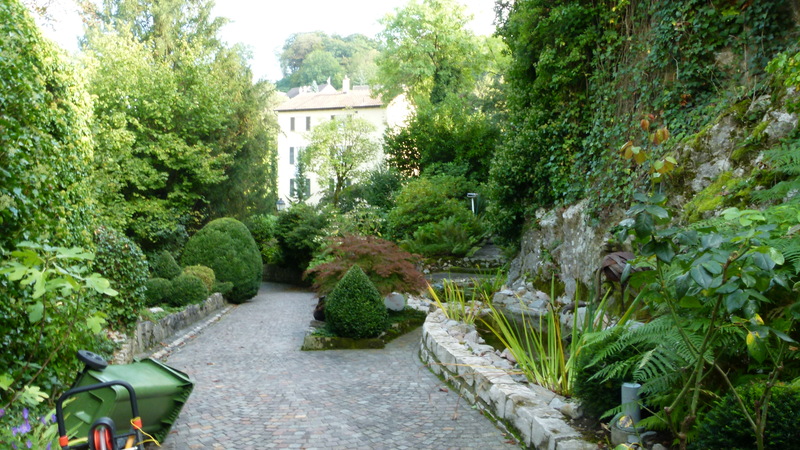 I dare walk through a small passage that looks very private and find this romantic garden behind the ruins. The bricks of the ruins have been used to build this quiet residential area, not far from the main street. 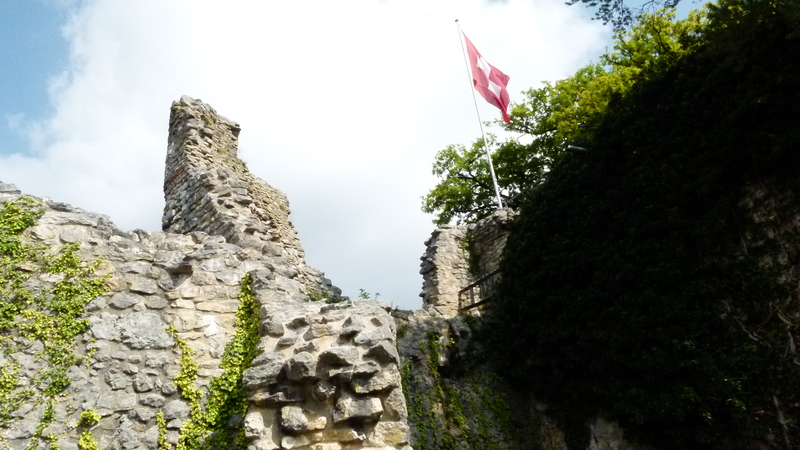 By car I have often driven through Münchenstein on the main street and never noticed the ruins. It had never ocurred to me to look for such a paradise so close to the busy traffic. I have already visited the three castles of the Wartenberg and I have done some scouting around the new Old-Schauenburg and the old New-Schauenburg. Interesting is also the Burgengratweg on the Blauen and, wherever we walk in the area of Basel, there is a castle that tells about the history between the 10th and the 15th century.